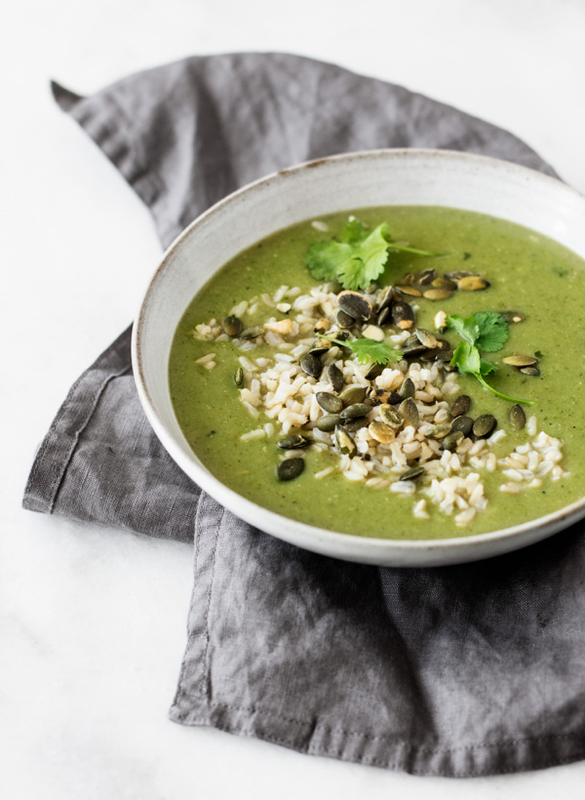 This soup is exactly what it claims to be: a super simple, very green soup. It’s not fussy, it’s not fancy, and it’s not hard to make. The flavors are mellow and simple: a bit of ginger, onion, and garlic, combined with the freshness and slight bitterness of leafy greens. 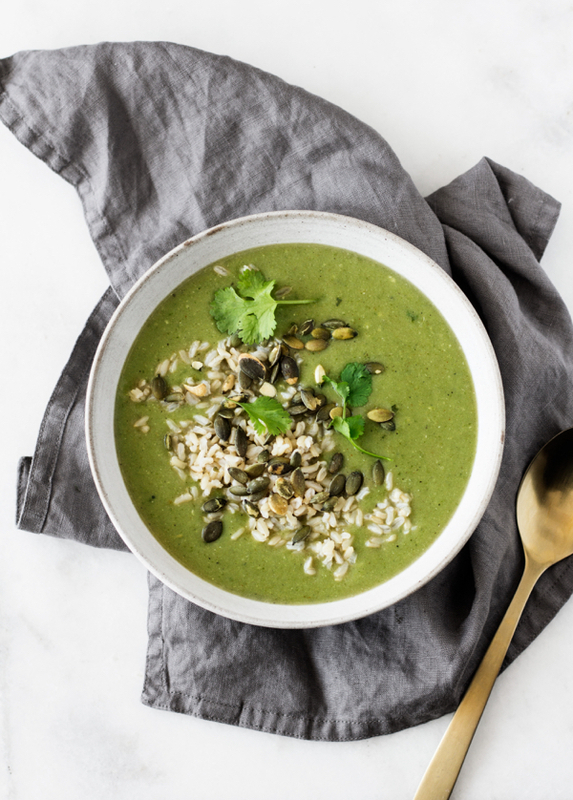 There are certainly bolder and more exciting soups out there, but if you’re looking for an easy, healthy way to eat more greens–one that’s neither a green juice nor a smoothie nor a salad–this soup is the answer. 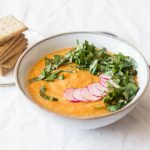 I’ve been making a variation of this soup for years, so it’s amazing that I’ve only now thought to share it on the blog. It began as a means of using up kale, spinach, and other green odds and ends, and it’s become a kind of comfort food, a recipe that I appreciate anew each time I prepare it. The soup is also a great transitional recipe between winter and spring. The potatoes and the splash of plant milk keep it creamy and give it some heft, but it’s also light and fresh, a great way to welcome asparagus when the season hits, or to put your chard and spinach to good use. I like to top the soup with rice, legumes, and other easy stir-ins as a means of adding texture. Or you can simply serve the soup with a plate of avocado toast and call it a day. For serving: white beans, cooked rice, cooked quinoa, coconut bacon, toasted chickpeas, toasted pepitas, fresh herbs, etc. Heat the olive oil in a large stock or soup pot over medium heat. Add the onion. Saute onion for 5 minutes, or until it's clear and soft. Add the garlic and ginger and cook for another minute, or until the garlic is very fragrant. Add the potatoes, salt, and broth to the pot. Bring to a boil. Reduce to a simmer. Simmer, covered, for 10 minutes, or until the potatoes are fork tender. Add the broccoli (or other vegetable). Simmer for 5-10 minutes, or until the vegetables are tender. Stir in the kale or other leafy greens, cover, and simmer for 5 minutes, or until the kale is bright green and wilted. 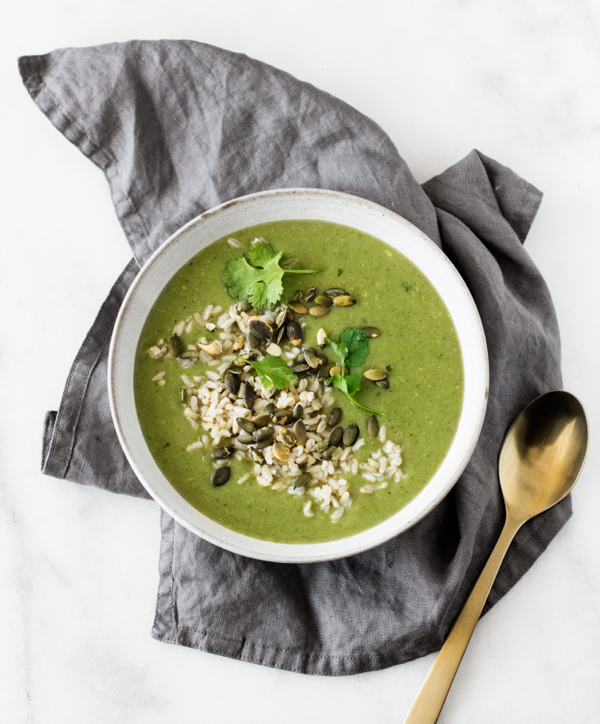 Transfer the soup to a blender in batches to puree thoroughly, adding water as needed if the soup is too thick (remember that you'll also add some soy or almond milk after blending). Return the soup to the pot and stir in the plant milk and black pepper to taste, as well as a pinch of salt if desired. Serve with toppings of choice. Soup will keep in an airtight container for up to three days and can be frozen for 2-3 weeks. As you can see, when I made it this week I added cooked rice and pumpkin seeds, which made a lovely addition to the bowl. Crackers and hummus also make a nice accompaniment. 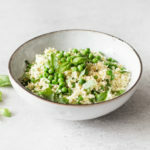 You can serve the soup as an appetizer before a spring meal, or you can pair it with a hearty main dish for a simple weeknight supper. For what it’s worth, I made the soup for Steven for the first time this week. There’s always something a little strange about sharing a personal “staple”–something you’ve been making so regularly for so long that you don’t even stop to think about whether or not other people would like it–with another person. Steven actually really liked the soup, and he was pleasantly surprised by the fact that it’s not overly green tasting. The combination of potatoes and greens definitely helps to keep flavors balanced. So, if you’re trying to entice a family member, friend, or roommate to eat more leafy greens, I suspect this would be a great choice. The best part of making this soup is allowing it to change as the seasons change. I almost always add kale or spinach, but I’ve used chard, too. I typically use broccoli in the winter (now that I’m starting to love broccoli stems, I suspect I’ll often use those), but asparagus is perfect in spring and zucchini is ideal for summer. In other words, all greens are welcome. I hope you enjoy this humble recipe. And I really look forward to a sharing new weekend reading post on Saturday. Sometimes the simplest recipes are the best 🙂 Looks delicious, Gena!! Looks awesome – we will definitely give this one a try. I love all kinds of vegetable soup! Anything with garlic in it also gets extra points from me :-). This soup sounds delightful and I love the lighting and composition in that top photo, beautiful. So. Freaking. Good. !!! ❤❤❤ I just finished making this, (and devouring a bowl), only to hear “what even is that? ?” from my typical college apartment-mates in the other room staring at the cooling pot on the stove. Which tells you three very important things! 2) I’m a college student, so this recipe had to be easy as all heck for me to prepare on a Thursday night during the week before finals!! So so so good, this is a staple now! My favorite part had to be the fact I was able to adapt it to fit the vegetables I had in my fridge about to go bad. I always overbuy for myself. While yes, I do it an inhuman amount of vegetables, nobody eats THAT much. I personally can’t eat potatoes, so I subbed in butternut squash I had pre-cut up from TJs. Also, somehow I was out of onion?? How on earth does that happen?? So I improvised and used two very thinly sliced zucchini instead, in keeping with the green theme. The whole thing fit beautifully in my Vitamix and came out velvety smooth. Seriously, I’m in heaven right now, and it was so easy! And my roomies love you for emptying out the veggie drawers. 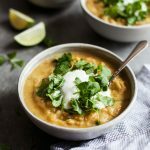 I love how you can dress up this soup with beans, grains, avocado toast etc – making it perfect for just about any mood! Made this tonight as part of Project: Keep Kait healthy and her cranky guts, happy. Used a mix of asparagus, chard, and spinach and made some jasmine rice on the side. LOVE how simple, delish, nutritious, and versatile this is. Just the thing I’m looking for as I start on my IBD journey. I actually switched out the potatoes for spinach and ended up with an even greener soup, it was just delicious. I made this soup and it was fantastic! And it seems to be a great cleanse for the digestive system…what an easy way to get greens in. Thanks for the recipe! You’re welcome! So glad that you enjoyed it.